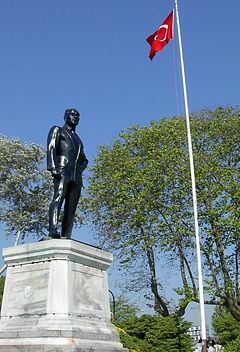 Atatürk was born in the city of Thessaloníki (Turkish: Selânik) in Northern Greece, where his birthplace is commemorated by a museum at the present day Turkish Consulate. In accordance with the then-prevalent Turkish custom, he was given the single name Mustafa. His father, Ali Rıza (Efendi), was a customs officer who died when Mustafa was a child. His mother's name was Zübeyde (Hanım). Mustafa studied at the military secondary school in Selânik, where the additional name Kemal ("perfection") was bestowed on him by his mathematics teacher in recognition of his academic brilliance. Mustafa Kemal entered the military academy at Manastır (now Bitola) in 1895. He graduated as a lieutenant in 1905 and was posted to Damascus. He soon joined a secret society of reform-minded officers called Vatan (Fatherland), and became an active opponent of the Ottoman regime. In 1907 he was posted to Selânik and joined the Committee of Union and Progress, commonly known as the Young Turks. The Young Turks seized power from the Sultan Abdul Hamid II in 1908, and Mustafa Kemal became a senior military figure. In 1911, he went to the province of Libya to take part in the defense against the Italian invasion. During the first part of the Balkan Wars, Mustafa Kemal was stranded in Libya and unable to take part, but in July 1913 he returned to Istanbul and was appointed commander of the Ottoman defenses of the Gallipoli area on the coast of Thrace. In 1914 he was appointed military attaché in Sofia, partly to remove him from the capital and its political intrigues. When the Ottoman Empire entered World War I on the side of Germany, Mustafa Kemal was posted to Rodosto (now Tekirdag) on the Sea of Marmara. He was later promoted to the rank of colonel and assigned the command of a division in the Gallipoli area. He played a critical role in the battle against the allied British, French and ANZAC (Australian and New Zealand) forces during the Battle of Gallipoli in April 1915, where he held off allied forces at Chunuk Bair and on the Anafarta hills. For this success, he was later promoted to the rank of Brigadier General, thus aquiring the title of pasha. He gained increasingly greater degrees of influence on the war effort. "Those heroes that shed their blood and lost their lives... you are now lying in the soil of a friendly country. Therefore rest in peace. There is no difference between the Johnnies and the Mehmets to us where they lie side by side here in this country of ours... You the mothers who sent their sons from far away countries wipe away your tears. Your sons are now living in our bosom and are in peace. Having lost their lives on this land they have become our sons as well." During 1917 and 1918, Mustafa Kemal was sent to the Caucasus front to fight against Russian forces, in which he had some success. He was later assigned to the Hejaz, to suppress the Arab Revolt against Ottoman rule. After resigning his commission, he eventually returned to serve in the unsuccessful defense of Palestine. In October 1918 the Ottomans capitulated to the Allies, and Mustafa Kemal became one of the leaders of the party in favor of defending the area roughly occupied by present day Turkey, while agreeing to withdraw from all the non-Turkish territories. Mustafa Kemal became in 1919 the leader of the Turkish emancipation. With a small and ill-equipped army, he repelled both the invading forces and the Sultan's troops and local rebels, eventually gaining control of the Turkish homeland. By September 1922, he had triumphed against both external enemies and internal opposition. Already a military hero, he proclaimed as the struggle ended that the military triumph must be followed by "victories in such fields as culture, scholarship, science, and economics." Atatürk is still held in reverence by many Turks for both his military victories and his cultural and socio-political reforms. Latife Uşaklıgil and Mustafa Kemal. He was briefly married to Latife Uşaklıgil between 1923 and 1925. It is widely acknowledged that he had relationships with many women . The government sent Mustafa Kemal Pasha to Samsun in North-Central Anatolia to take command of the nineteenth Army, a formation which, in accordance with the restrictions placed on the empire by the Allies in the Treaty of Sèvres, was supposed to be disbanded. This was meant to be an insult to Kemal, who, being a nationalist, was an enemy of Sultan Mehmed VI's capitulatory government. He then turned the tables and seized the opportunity to free Turkey from Allied occupation. In June 1919, on orders, he left the capital, Istanbul, and founded a Turkish nationalist movement in Samsun, but the movement would soon be based in Ankara, symbolizing a new start for the new republic and nation. As Kinzer (2002) comments, this location was also much nearer “the masses in whose name he was ruling” (44). In April 1920, a provisional Parliament, the Grand National Assembly, was formed in Ankara, offering Kemal Pasha the title 'President of the National Assembly.' This body repudiated the Sultan's government in Istanbul and refused to recognize the Treaty of Sèvres. The Greeks understood the threat posed to their position on the Aegean coast by the rapid consolidation of Kemal Pasha's forces in central Anatolia and advanced inland to meet them. Conflict between the two armies was inconclusive, but the nationalist cause was strengthened the next year with a series of brilliant victories. Twice (in January and again in April) Ismet Pasha defeated the Greek army at İnönü, blocking its advance into the interior of Anatolia. In July, in the face of a third offensive, the Turkish forces fell back in good order to the Sakarya River, eighty kilometers from Ankara, where Atatürk took personal command and decisively defeated the Greeks in a twenty-day battle. In the meanwhile, Kemal Pasha signed the Treaty of Kars (October 23, 1921) with the Soviet Union, a treaty of friendship in which Turkey ceded the city of Batumi, in present-day Georgia, to Lenin's Bolsheviks in return for sovereignty over the Armenian cities of Kars and Ardahan. Kemal Pasha's victory in the Greco-Turkish War of Independence (1919-1922) assured Turkey's sovereignty. The Treaty of Lausanne superseded the Treaty of Sèvres and Turkey recovered all of Anatolia and eastern Thrace from the Greeks and Armenians. The following years represented more friendly relations between the two countries, with the Greek Prime Minister (ex-enemy during the Turkish Independence war after World War I) Eleftherios Venizelos even nominating Atatürk for a Nobel Peace Prize in 1934. Kemal Pasha spent the next several years consolidating his control over Turkey and instituting a variety of wide-ranging political, economic and social reforms. These reforms caused some opposition in Republican People's Party which was founded by Mustafa Kemal in September 9, 1923. Then Mustafa Kemal directed General Kazım Karabekir to establish Progressive Republican Party for opposition in Turkish National Assembly. This party opposed state socialism of Republican People's Party and suggested liberalism. After some time, the new party was taken over by religious conservatives. Finally the civil disorder of Sheikh Said (usually dubbed a Muslim fanatic) resulted in the end of Progressive Republican Party under the Maintenance of Order Law Act (1925). On August 11, 1930, Mustafa Kemal decided to try a democratic movement once again. He charged Ali Fethi Okyar with establishing a new party. In Mustafa Kemal's letter to Ali Fethi Okyar, laicism was insisted. At first, the new Liberal Republican Party succeeded all around the country. Once again the opposition party became a cover for religious conservatives who were opposed to the secular nature of the state. Finally Ali Fethi Okyar abolished his own party. Mustafa Kemal never succeeded in democratizing the parliamentary system. Mustafa Kemal regarded the fez (which Sultan Mahmud II had originally introduced to the Ottoman Empire's dress code in 1826) as a symbol of feudalism and banned it, encouraging Turkish men to wear European attire. The hijab (veil) for women, while never formally banned, was strongly discouraged; and women were encouraged to wear western apparel and enter the country's workforce. From 1926, the Islamic calendar (which starts in the year 622 C.E.) was replaced with the Gregorian calendar. In 1928 the government decreed that a modified Latin alphabet replace the Arabic script, and citizens between the ages of six and forty were required to attend school and learn the new alphabet. The conservative clergy fiercely opposed these reforms, trying in vain to maintain its traditionally strong influence. As a result of the reforms literacy increased dramatically. The reforms also included extensive removal of Arabic and Persian words from the Turkish language. Mustafa Kemal opened new schools, where, as part of the curriculum, fine arts were taught to boys as well as girls. Girls had been traditionally excluded entirely from education, but now a universal system of education was introduced for children of both sexes. He also lifted the Islamic ban on alcoholic beverages: Mustafa Kemal had an appreciation for the national liquor, raki, and consumed vast quantities of it. In 1934 he promulgated a law requiring all Turks to adopt surnames. The Grand National Assembly of Turkey gave him the deferential name Atatürk, meaning "father of Turks," and assumption of that name by other men is still forbidden by law. Atatürk prized science and rationalism as the basis of morality and philosophy. According to his biographer, John Patrick Douglas Balfour, Atatürk considered himself a rational believer of Islam, in which Islam could complement science and rational thinking, but was strongly opposed to fanaticism. With abiding faith in the vital importance of women in society, Atatürk launched many reforms to give Turkish women equal rights and opportunities. The new Civil Code, adopted in 1926, abolished polygamy and recognized the equal rights of women in divorce, custody, and inheritance. The entire educational system from the grade school to the university became coeducational. Atatürk greatly admired the support that the national liberation struggle received from women and praised their many contributions: "In Turkish society, women have not lagged behind men in science, scholarship, and culture. Perhaps they have even gone further ahead," he said . Atatürk gave women the same opportunities as men, including full political rights. In the mid-1930s, 18 women, among them a villager, were elected to the national parliament. Later, Turkey had the world's first female Supreme Court justice. Atatürk abolished the veil, which for him was a symbol of suppression, calling it a “barbarous practice” and a “spectacle that made the nation an object of ridicule” (cited in Kinzer, 2001: 45-50). An advocate of Kemalism, Hakki Battacioglu later wrote that: “…there is no difference between men and women in the Turkish land anymore. Sexual difference is not a difference that the nation should regard or deal with ... What we need are men and women, people who have adopted the national values, national techniques...” (qtd. in Arat 2000, 142). Atatürk once stated: "Culture is the foundation of the Turkish Republic." His view of culture included both his own nation's creative legacy and what he saw as the more admirable values of world civilization, and he put an emphasis on humanism above all. He once described modern Turkey's ideological thrust as "a creation of patriotism blended with a lofty humanist ideal." To assist in the creation of such a synthesis, Atatürk stressed the need to utilize the elements of the national heritage of the Turks and of Anatolia—including its ancient indigenous cultures—as well as the arts and techniques of other world civilizations, both past and present. He emphasized the study of earlier Anatolian civilizations, such as the Hittites, Phrygians, and Lydians. The pre-Islamic culture of the Turks became the subject of extensive research, and particular emphasis was laid upon the fact that—long before the Seljuk and Ottoman civilizations—the Turks had had a rich culture. Atatürk also stressed the folk arts of the countryside as a wellspring of Turkish creativity. However, Atatürk's distancing of modern Turkey from the Ottoman culture and imperial past led to neglect of the study of those aspects of the Ottoman legacy that can be regarded as positive and beneficial, not feudal and outmoded. The visual and the plastic arts—whose development had on occasion been arrested by some Ottoman officials claiming that the depiction of the human form was idolatry—flourished during the presidency of Atatürk. Many museums were opened; architecture began to follow more modern trends; and classical Western music, opera, and ballet, as well as the theater, also took greater hold. Several hundred "People's Houses" and "People's Rooms" across the country allowed greater access to a wide variety of artistic activities, sports, and other cultural events. Book and magazine publications increased as well, and the film industry began to grow. Atatürk died in 1938 of cirrhosis, a probable consequence of his strenuous lifestyle. There is a strong evidence that his cirrhosis was not alcohol related and but a consequence of a disease he contracted in his youth. His successor, İsmet İnönü, fostered a posthumous Atatürk personality cult which survives to this day, even after Atatürk's own Republican People's Party lost power following democratic elections in 1950. Atatürk's face and name are seen and heard everywhere in Turkey: his portrait can be seen in all public buildings, on all Turkish banknotes, and even in the homes of many Turkish families. Giant Atatürk statues loom over Istanbul and other Turkish cities. He is commemorated by many memorials all over Turkey, like the Atatürk International Airport in Istanbul and the Atatürk Bridge over the Golden Horn. Some Muslims regard Turkey as the model that should be imitated elsewhere in the Islamic world. While some Muslims argue in favor of secularism, suggesting that Muhammad's combination of the political and religious spheres was circumstantial, others criticize Atatürk for banning Islam from the public square. Others point out that Ottoman law had also largely relegated Islam to personal matters, so Atatürk was actually perpetuating the previous model (see Ahmed 2002, 99). Atatürk promotion of women's rights resulted in the subsequent election of a woman Prime Minister, Tansy Ciller (1993-1996). However, while some of Atatürk's policies are no longer popular, he is still highly respected as the architect of the Turkish Republic, without whose effort Turkey may not have gained independence or might have continued for a longer period as a feudal state. It would have taken a different direction. Turkey's pro-European policy may prove to be very valuable in helping Europe to regard Islam, and its own Muslim communities, as part of European culture, not alien. Turkey could also serve as a bridge between Europe and other Muslim-majority countries. As Turkey works out how religious values can inform government policy while at the same time remaining a secular democracy, other nations can listen and learn. The challenge is to find ways of allowing religious concerns and values to be expressed in the public square, alongside non-religious and other perspectives, without seeking to privilege one religion or ideology over others. Secularism does not mean silencing religious voices, only that they should not be given any special authority. Some Muslim supporters of secularism suggest that Turkey cannot serve as a model because Atatürk imposed secularism from above. It needs to grow from the bottom up. In the late twentieth century, two Islamic parties were elected to political power in Turkey In 1999, the Islamic Virtue Party won the majority of seats but was banned in 2001 on the grounds that it was anti-secular, which was unconstitutional. In 2002, the Justice and Development Party won. It remained committed to a pro-European, secular policy although unlike the nation's founder it is guided by Islamic values. It has sought membership of the European Union. Turkey joined NATO in 1952. Islam has continued to flourish in Turkey, as Ahmed comments “There are over 3,000 mosques in Istanbul and they are more and more frequented ... The call to prayer is in Arabic and are no longer in Turkish (as once decreed by Atatürk). There are eight theological colleges with about 10,000 students” and women “increasingly wear veils to emphasize their Islamic identity” (102). “Most Turks,” says Ahmed, “want Islam to be part of their cultural identity,” and not a political system to replace the “existing political institution” (102). Some of those who do advocate an increased role for Islam in the political arena have lampooned Atatürk as an “alcoholic and mock his sexuality” (100). Certainly, Atatürk's role in founding the modern nation state of Turkey, as well as in giving intellectual leadership to his new country, earn him a place in history. Garret Ward Sheldon (2000) compares his role with that of Thomas Jefferson, pointing out similarity of circumstance; both men “rejected many aspects of the imperial societies that raised them” and opposed foreign oppression. Jefferson opposed the British, Atatürk the Allied powers who, having defeated the Ottomans, were “imposing a foreign oppression on Turkey” (2). Both men gave their nations a philosophical foundation. Aware of the history of enmity between Europe and the Muslims world, Atatürk wanted to move beyond this and said that his own spiritual legacy would be one of 'science and reason,' not 'unchangeable petrified doctrines.’ Muslims were wrong to 'disdain progress' . 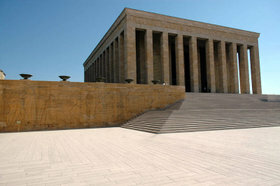 Atatürk could be crude, as when he called the fez a “symbol of negligence, fanaticism, and hatred of progress and civilization” (Kinzer 2002, 44); his personal life was morally flawed, but he left a lasting on history and his legacy has many positive aspects that makes his memory an honored one for many Turks and others today. Balfour, John Patrick Douglas. Ataturk: The Rebirth of a Nation. London, Weidenfeld and Nicolson, 1964. All links retrieved November 1, 2018. History of "Mustafa Kemal Atatürk"
This page was last modified on 1 November 2018, at 16:35.